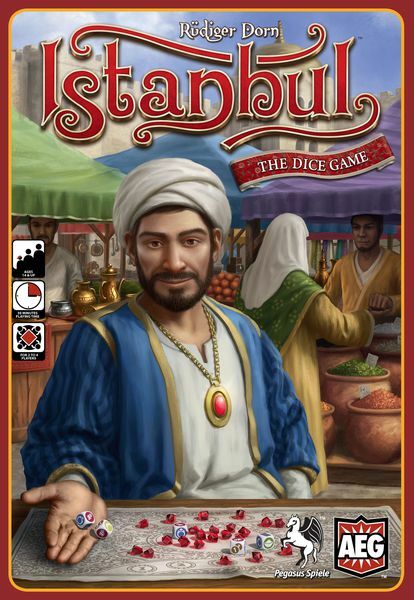 Istanbul (the regular board game) is one of my favorite strategy games in recent years. 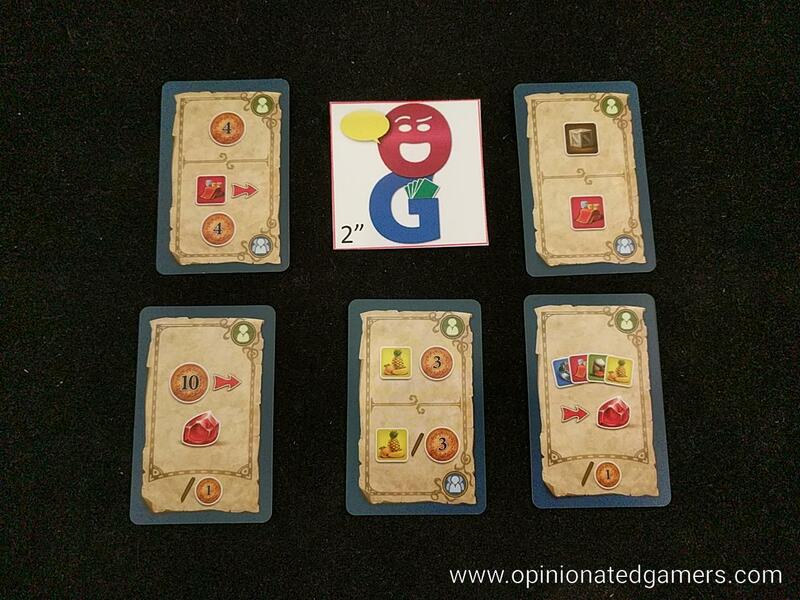 I am not alone in this opinion as the game was named the winner of the 2014 Kennerspiel des Jahres. In that game, there is a modular bazaar of market tiles where players race to collect rubies. Following the recent trend of successful games, the complex board game has been minimized into a dice version. This dice game has a small board which is placed on the table, and there are multiple tracks on this board. Place rubies on the spaces on the track based on the player count. Each player gets a small player aid card which summarizes the possible actions in the game. There is a deck of Bazaar cards – they are shuffled and placed as a face down deck near the board. Finally, the Mosque tiles are shuffled facedown and a display of 6 tiles is created. The dice in the game represent your assistants (the discs from the regular game). Each of these dice has the following sides: card, money, and the four types of goods. The start player starts the game with no money, and each player in turn order receives one more gold than the player before them (so that the last player in turn order in a 4 player game starts with 3 gold). There are three phases in a player’s turn – the active player completes all the phases, and then play passes to the next player for his turn. The goal of the game is to be the first to collect the target number of rubies – 5 rubies in a 4 player game. When this happens, play continues to the end of the current round such that all players have had the same number of turns. The phases of a turn are: 1) income, 2) roll the dice, 3) take actions. Income comes from previously collected Mosque tiles – they might provide money, white crystals, or Bazaar cards. Simply look at the tiles splayed in front of you and take the depicted things. Once income is collected, the active player rolls the dice. The base number of dice to roll is five, and additional dice might be provided by collected Mosque tiles. If you have any white crystals, you can discard one to re-roll any or all of the rolled dice. You can re-roll as many times as you like so long as you have enough crystals to pay for the re-rolls. When you are satisfied with the roll result, you then use the dice to take actions. Each die can only be used once per turn for an action. Refer to the list of possible actions on your player aid to see what you can do. If you have collected Goods Markers on previous turns, you can spend those markers in addition to those seen on your dice to carry out actions. Some of the actions use icons to collect resources, crystals, cards or money. Simply discard the dice or the goods markers per the chart on your player aid. You can use card icons to reveal a number of card equal to the number of card icons; you then take the action of any ONE of the revealed cards and then discard all revealed cards. The cards might provide goods or lira, might allow you to gain a ruby at a discount. You could also use icons to buy a Mosque tile. There are six tiles available at any given time, and the cost for each is seen at the top of the tile. Spend the depicted icons and take the Mosque tile and place it in front of you. You will have whatever income/special ability shown on it for the rest of the game. Note that if you have collected your fourth Mosque tile, take a Ruby from the board in the Mosque area (bottom central). There are also six different tracks on the board where you can collect rubies. There are four tracks in the upper portion of the board, one for each of the four goods types. You can turn in a number of matching goods (either dice icons OR goods markers) equal to the highest number visible on the track for that type of good – and if you do, you collect a ruby off that track. In the center, there is a money track. If you discard money equal to the number of the highest visible space to take the next ruby off the track (thus making the next one more expensive). You will also find a goods track in the center, where you must use one icon of each type and an increasing number of goods of any type to collect the next ruby on that track. The rubies at the bottom of the board are only taken when you collect the requisite number of Mosque tiles. If you have reached the target number of rubies, announce this to everyone so that everyone knows that the current round is the final round in the game. Otherwise, your turn ends, and you pass the dice to the next player in turn order. At the end of the final round, the player with the most rubies wins. 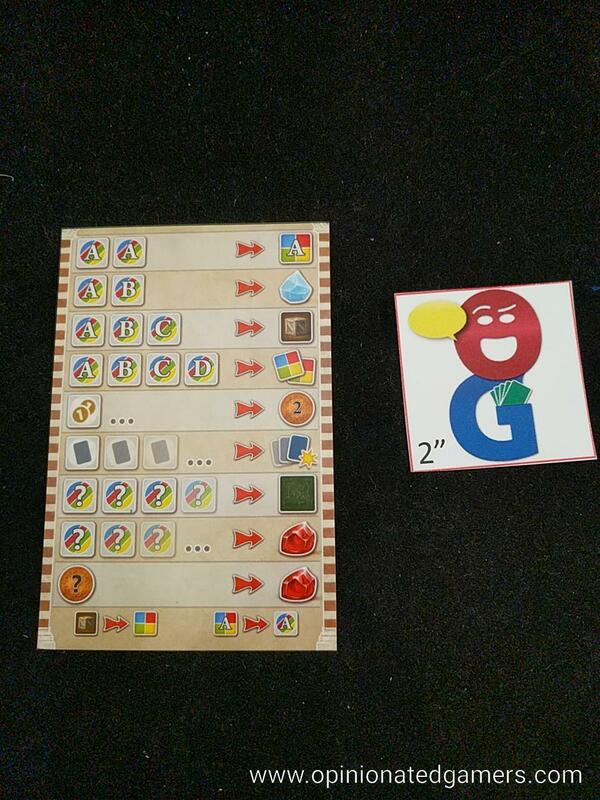 If there is a tie, players sell their goods markers for 3 Lira each and their white crystals for 2 Lira each. The player with the most money breaks the tie. Istanbul the Dice Game is nicely situated between these two extremes. The game definitely feels like its predecessor with the collection of goods and the race to collect rubies. The dice game is certainly less complex and provides a nice way to play Istanbul when you don’t have the table space for the main game and/or not the 90 minutes needed to play the original version. The mechanism of progressively more expensive rubies on multiple tracks is just like the full game – but the way in which to collect the goods and money is different. Turns move along at a moderate pace; there are some turns which can slow down as players have to calculate the odds of re-rolling or not based on the dice results as well as the previously collected markers. There is a nice amount of racing tension in the game. Primarily, there is the race to collect rubies quickly as the costs constantly rise as the game continues. There is also a race to develop your engine. 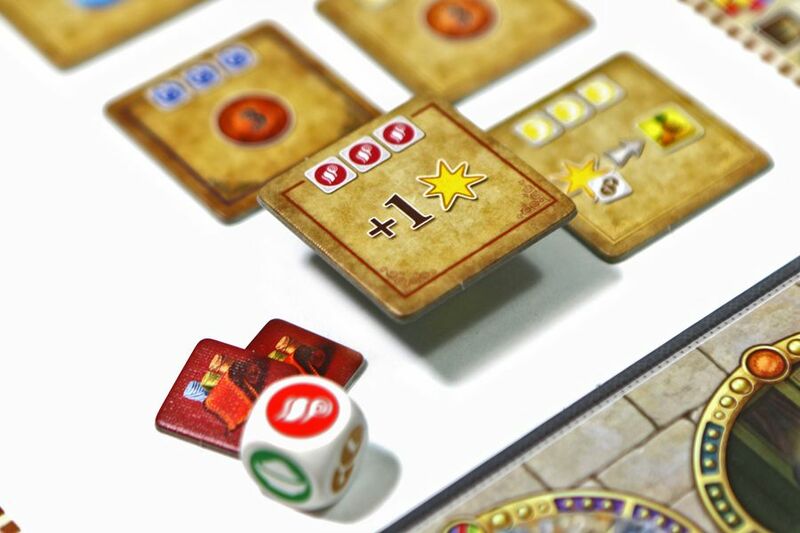 The Mosque tiles give income or dice in each successive turn after they are collected. Thus, the sooner you buy the tiles, the more benefit you will get from them, and the easier it will be to collect things later in the game. Of course, if you use your resources to buy the Mosque tiles early on – you’ll likely miss out on the cheapest Rubies. So, you’ll have to make a choice between engine building and cheap rubies early on – and then in the midgame, you’ll have to decide when it’s time to stop working on your engine and time to simply concentrate on getting the Rubies. There is a bit more swinginess in the dice game, as you would have probably expected. Obviously, the dice inherently bring chance into the game. Getting lucky with the Bazaar cards also can play a large role in the game. I don’t mind the stronger luck component in this version; it helps distinguish it from the base game – something that I feel other dice or card follow-ups do not do well (Castles of Burgundy, I’m looking at you…). The components are the same quality as the base game – nothing spectacular, but I am pleased by the fact that they match the original game. The box is the small format Pegasus box, but the components could possibly be compressed into a much smaller box – and this is something I intend to do. This will make a perfect traveling game if I can get it into a smaller format. Istanbul the Dice Game has much of the strategy and feel of the full game, but the shorter playtime will ensure that it gets played more often. A keeper for sure in my collection. Doug G: I like the original, but one of the main reasons was the planning of one’s route to get to the various parts of the modular board. Removing that aspect just ramps up the problematic luck of the dice rolls, thus making it a game that’s just not for me (or Shelley). Larry: This is a well designed game. What I like most about it is that Dorn has managed to come up a new way of resolving things in a dice game, which couldn’t have been easy. Because of the variety of ways dice faces can be used in the different actions, most turns only consist of a single die roll, which moves things along nicely. And yet, there are still interesting decisions to be made. I also like that there is some engine building involved as well. I prefer the original game, but honestly, they are two very different designs and comparisons between the two probably aren’t that relevant. I think I would have liked a little more dice manipulation, but this is a very solid dice game which plays quickly and features numerous small decisions. There’s always room on the table for a title like that. Mark Jackson: While I found the game to be perfectly playable (and appreciated the variety of paths to victory), I feel no need to play it again. Greg S: For me, the game’s saving grace is its brevity. I don’t want a game with such a pronounced amount of luck to be lengthy. Istanbul: The Dice Game plays quickly, which helps make the amount of luck acceptable. The big question, of course, is “Is this better than the original game?” I think the answer depends upon the market. 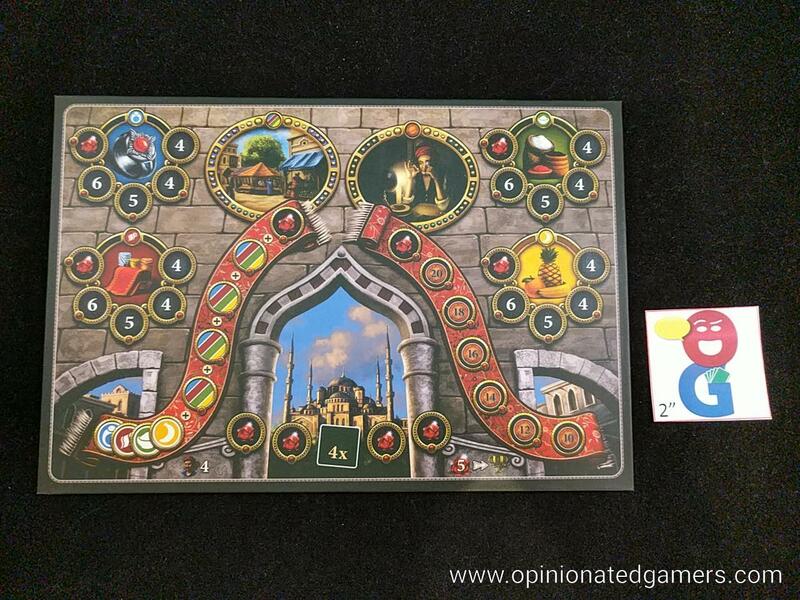 For gamers, the answer is a definitive “no.” The game lacks the tough decisions and cleverness that Istanbul possesses. When one does well in Istanbul, one has achieved the result. Here, the choices are very limited and not very taxing. One’s ultimate fate or achievements can usually be credited to the vagaries of fate; i.e., luck. Still, the game is enjoyable, especially so for folks who are not fans of more strategy oriented games. The game is very well suited for the mainstream market—folks who only play games casually or in a social setting. It would be a perfect candidate to be sold at mainstream game markets such as Target or Barnes and Noble. Gamers will likely only find it appealing as a “filler” or when playing with families or non-gaming friends. Nothing wrong with that, mind you, as those opportunities are usually quite frequent. Tery N: I had reviewed this back in March, and I thought it was great. I’ve played it several times since then, and my opinion has not changed. I disagree with some of my fellow gamers in that I think it is better than the base game. It takes all the things I liked about Istanbul the Board Game and streamlined the things that I thought were cumbersome or unnecessary. The movement, the abilities of the markets and the interactions with other pieces are removed, leaving you with a quick-to-play game that still involves the key strategic elements of the original game. The dice and your actions and abilities can be manipulated with collection of mosque tiles and the cards, so luck is never an overwhelming factor. Dan Blum: I agree with Doug. The most interesting aspect of the original game is planning your sequences of actions efficiently. That’s completely lacking here, which certainly makes the two games feel different, but also makes the dice game fairly uninteresting to me. It’s not bad, just… unnecessary. 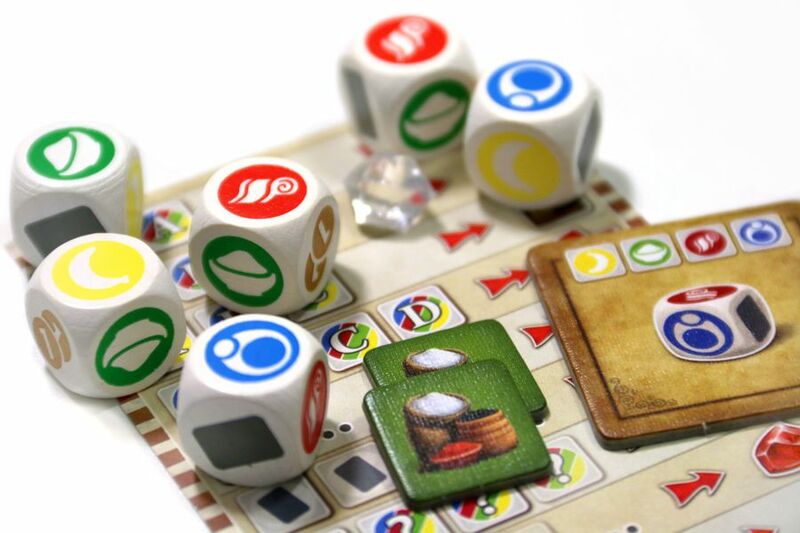 It doesn’t stand out from the many, many other dice games released in recent years. I like it. Larry, Jonathan F., Joe H.
Not for me. Doug G.